A Windsor based company with Windsor based tourist guides, Windsor Tourist Guides Ltd was founded by Amanda Bryett, an award-winning Institute of Tourist Guiding Blue Badge Tourist Guide. 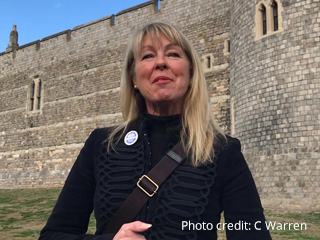 With a lively interest in history, and the monarchy in particular, Amanda trained as an elite Blue Badge tourist guide following a career as a communications manager. Having attended conferences all over the world during her 15 years in the pharmaceutical industry, she is well aware of delegates' wish to escape for a fun, entertaining evening guided walk before a conference dinner! A local resident for over 25 years, she offers a fascinating insight into the history of Windsor as well as life today in the royal town. All our professional Blue Badge tourist guides are passionate about Windsor, our heritage and are accredited Windsor Castle guides. To say that you got rave reviews is a complete understatement! I so appreciate you making her time in Windsor so enjoyable - and you completely "made" her trip!